You’ll be surprised by how quickly and confidently your students are writing when you use this activity with them. This is a great way to build confidence in writing, while reviewing and practicing verb forms and meaning. Before engaging in the activities, there are slides to review subject pronouns and verb forms. Before each activity, students number their paper or mini white board 1-8. A picture of a subject and an infinitive are revealed on the left side of the screen and possible sentence endings are listed on the right side of the screen. Students write the correct verb form and an appropriate ending from the list. There is typically only one possible ending, but in some cases there may be more than one possibility. Students have 1:30 (one minute and thirty seconds) to write all 8 sentences. When the time is up the words are covered over. Students check their work in the next slide. 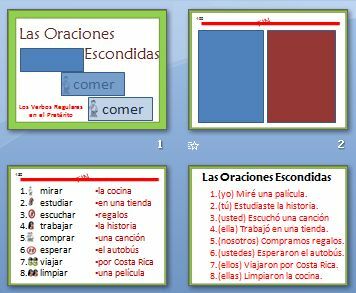 The next slide repeats the exercise, but the verbs and subject pronouns are paired differently. Students have one minute this time through since they are familiar with the sentence endings. This entry was posted in Activities and Games, Writing and tagged Writing. Bookmark the permalink.